What can I use as proof? It must be dated within two years of your new policy's start date and should be sent to us within 28 days of your policy's start date. How do I send my proof? You can use our online form to send us a PDF document or to send a photo of the document from your phone. 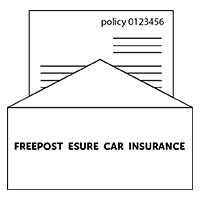 You just need to write “FREEPOST ESURE CAR INSURANCE” on the envelope exactly as shown above. It really is that simple! This address is freepost so it doesn’t need a stamp. Please make sure you include your new policy number when you send your documents so we can identify you quickly. You can use page 3 of your renewal invitation as proof of your No Claim Discount. If you don't have this document, you can use our online form to request a 'Proof of No Claim Discount' email.